After Frida returned to Mexico from the United States, she was staying in bed for a while and then wearing a steel corset for eight months. But her health condition has been worsening instead of improving. She got sharp pains in her spine and lost her appetite due to the long-lasting pain. But she still paints and in a letter she wrote to her friend, she mentioned this painting, Tree of Hope, 1946 as "nothing but the result of the damned operation!" In this painting, under the gloomy sky the sun and moon divided the background into two halves of light and dark. In the middle Frida was sitting there and weeping in a read Tehuana costume. Nevertheless she seems strong and confident. Behind her on a hospital trolley, lying a second Frida, who is anesthetized and her surgical incisions still open and dripping with blood. Frida was holding a pink orthopedic corset while sitting in the wooden chair. In her another hand she was holding a flag which has words from a song "Cielito Lindo" - "Tree of Hope, keep firm." On the flagpole, there is a red tip looks like a surgical instrument stained with blood, or a paintbrush dipped in red paint. The barren landscape behind her has two fissures which is metaphor of the wounds on her back. Frida painted this painting for her patron Eduardo Morillo Safa. In a letter to him Frida mentioned: "There is a skeleton (or death) that flees in the face of my will to live." But she later removed the skeleton to please Eduardo. But she cannot eliminate the menace of death. 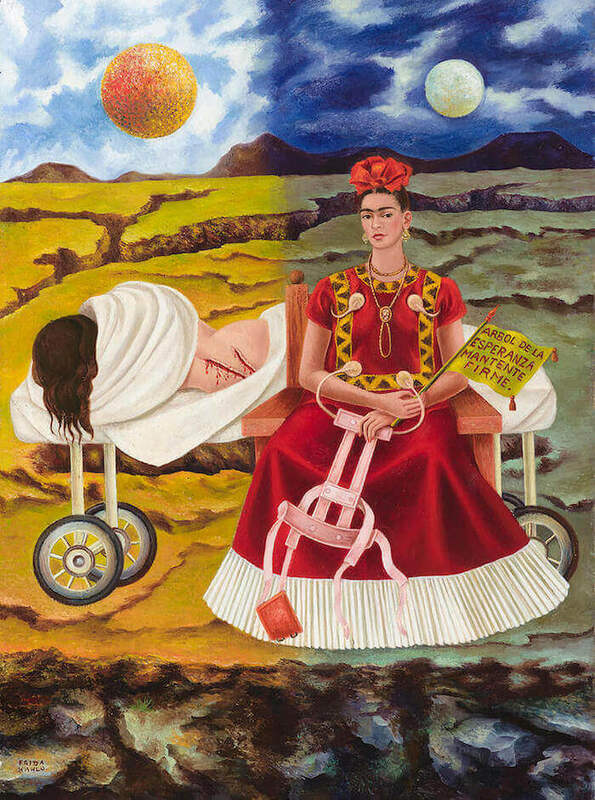 In this portrait, by putting two Frida's images together, one is a victim of botched tragedy, the other is the heroic survivor, Frida used it as a retablo and an act of faith. Frida takes charge of her destiny and become her own saver and hero.